Nearly three weeks after the federal government urged more than two dozen Hollywood celebrity home tour companies to stop using open-air vans due to serious safety concerns, the I-Team has found these businesses are continuing to operate as before. 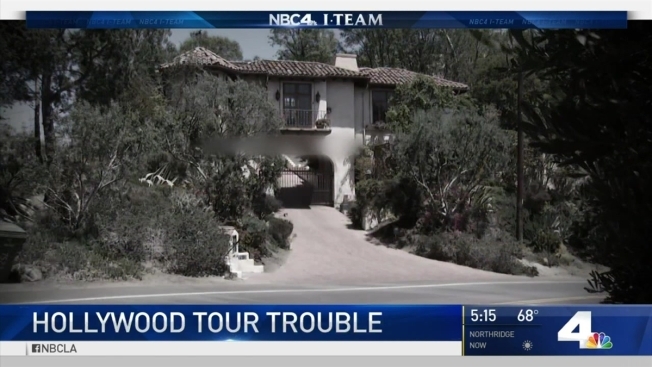 NBC4 went undercover to expose how many tour guides drive recklessly and provide inaccurate information about the location of celebrities' homes. Automotive industry experts also warned that the modified convertible vans may pose dangers because the way the tops are removed may be undermining the integrity of the vehicle structure. The I-Team found that when customizing the vans, many operators also modify factory-installed seatbelts, or remove them altogether. As a result, the National Transportation Safety Board sent a letter to 27 tour van operators, expressing concern to the companies that they are "putting the safety of your passengers and employees risk" and urging them "to discontinue use of these vehicles." While Hollywood tours say they can give you an insiders glimpse into the glitzy world, many feed tourists a steady stream of lies. Jenna Susko reports for the NBC4 News Aug. 11, 2016. NHTSA, which is an arm of the U.S. Department of Transportation, also issued a special order, demanding the tour operators to provide detailed information about how their vans have been modified. If the operators don't provide a response, signed under oath, by Sept. 19, they face daily fines of up to $21,000 until they comply. "We don't believe these vehicles are safe in their present condition, and they shouldn't be transporting passengers," said NHTSA spokesman Bryan Thomas. However, the I-Team has found that despite the federal government's action, the tour company owners continue to carry hundreds of passengers through the Hollywood Hills and other celebrity neighborhoods every day. 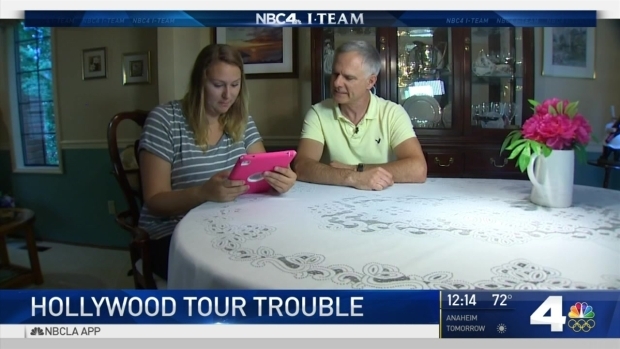 When contacted by phone to provide an explanation for the decision to keep operating, one tour company owner called an NBC4 producer "Lucifer;" others shouted obscenities. More chose to simply hang up without responding. State Assemblyman Adrin Nazarian is currently drafting new legislation to crack down on companies that operate unsafely and lie to tourists, and expressed alarm about the tour van operators' behavior. "At the end of the day, if we don't have enforcement capabilities and enforcement teeth, nobody is going to abide by it," he said. The I-Team has heard from frightened residents and frustrated law enforcement officers who say Hollywood buses are turning LA's streets into a danger zone. Jenna Susko reports for NBC4 News at 12 on Saturday, August 13, 2016. "Representatives from the City, the Hollywood Chamber and the Tourism and Convention Board are meeting this month to discuss possible actions to further ensure the safety of our visitors. The City, Chamber and Tourism Board are concerned about reports of unsafe tour bus operations and ready to assist federal regulators as needed." "The Department is unaware of any incidents attributed directly to the modification of these vehicles," the CHP said in a statement to NBC4. "The CHP is collaborating with the National Highway Traffic Safety Administration to discuss their (NHTSA's) expressed concerns with the modified buses." The I-Team found other major cities, including New Orleans, require tour leaders to submit to background checks and also pass a history test. "It's a very extensive procedure and we want that, because we want to make sure our tour guides act as the professionals they are at all times," said Gene Reyes, President of the National Federation of Tourist Guides Association. He says it's important that cities have training programs available, and that New Orleans has greatly benefited from it. "We certainly don't want people not prepared at all to be representing the tourist industry. That's a black eye for us and that's the last thing we want." Both San Francisco and San Diego have tour guide certification programs, but Los Angeles doesn't. Reyes even took a celebrity homes tour himself while visiting Los Angeles. "I have to tell you, I was not very impressed, to say the least," he said. "I was not impressed with the tour guide, I was not impressed with the entire tour. It was not the level of tour, I assure you, that we strive for here in New Orleans and other major cities." Reyes added that the national organization would like to help start a tour guide association in Los Angeles.